Oasis, Ara Damansara is one of the latest addition to the surrounding community. Within this complex, lies a large courtyard with adjacent bungalow-like restaurants. One of the most popular cafes in that area would be the Mr & Mrs Cafe and The Crave Cafe. With all that dominance from other cafes, it got me thinking, what could Purple Pasta Cafe offer that is different from a regular cafe? Turns out, they might. Scroll below to find out. Do Note, dishes with a * are made to order by reservation only. This is to ensure the freshness and quality of the food served. Creamy vanilla ice cream served with coffee powder. Minty and refreshing. A great combination. A fantastic drink which was a right balance between sweet, sour and fizziness. Great for a hot day. A simple combination of lettuce, cherry tomatoes, arugula, croutons, served with Parmesan cheese and mayonnaise. Cube salmon gravalax with apple chunks mixed with mayonnaise and ebiko. Lovely, rich, delicate and fresh. Salmon cubes were juicy and creamy thanks to the ebiko mayonnaise. The additional apple chunks gave that little extra sweetness to the dish. Overall, loved it. Fresh plump prawns cooked with lemon juice and served with raw onions and purple cabbage. Prawns were rather fresh and juicy, not to mention sour as well. The play of textures was interesting, you get both crunchiness and chewiness at the same time. Grilled prawns served with asparagus and thermidor sauce & foam. Sauce was lovely - a rich nutty flavour. The foam was light but cheesy; a great balance and I loved it. Asparagus was cooked nicely and remained crisp. Similar to the one above but without the thermidor foam, which was quite unfortunate. The plating looks stunning here but lacks the depth of flavour the previous one had. In the end, I preferred the first one more. This, was, absolutely divine. The intensity of flavour, texture and scent were superb. The mutton was soft, tender and flavourful with sauce being slightly spicy and creamy. Furthermore, the use of dark chocolate to intensify the richness was brilliant. Everything was balanced and it was simply wonderful. I literally lick the plate clean, with a spoon of course. Chicken stuffed with spinach, walnut and mashed potato served with mashed pumpkin and cheddar on the side. Crispy, moist, succulent and not to mention crunchy. A great take on texture but lacks depth of flavour. These are one of the highlights of Purple Pasta Cafe; the RM5 pasta. Served in regular portion, like everywhere else. So no need to worry about the withdrawal of size for price. Taste wise, it was pretty good. Definitely much better than most RM10 spaghetti I've had. 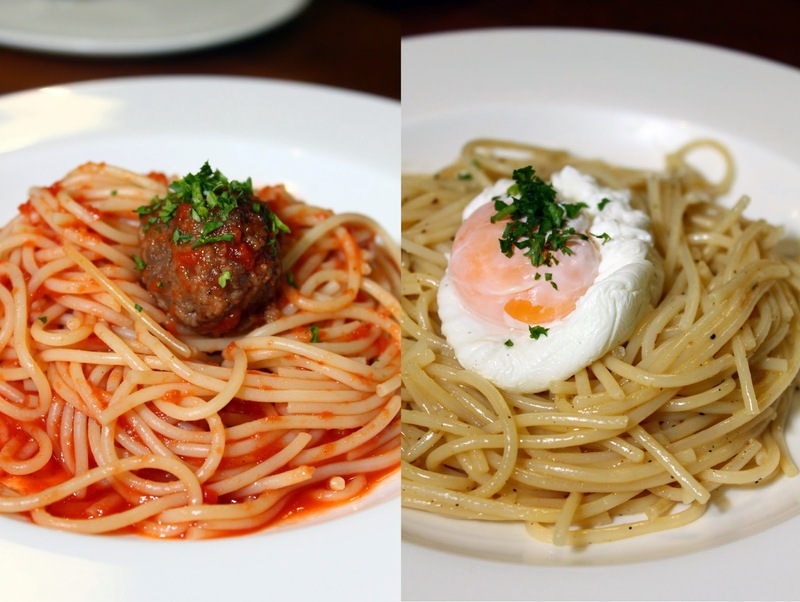 From the dishes above, Purple Pasta Cafe aims to serve well presented food, much like what fine-dining restaurants do. The technique and execution were pretty similar as well. Its just a more toned-down version of fine-dining restaurants. Price-wise, I believe is much cheaper as well. In conclusion, I would recommend a few dishes; Fra Diavolo, Prawn Thermidor, Salmon Tartare, Garden Salad and of coruse, the RM5 pasta!